‘BOUNTY’ FOR DESCENDANTS OF MUTINY ON THE BOUNTY! The 52 residents of the tiny, (just two miles long and a mile across) isolated, South Pacific PITCAIRN Island have benefited from millions of pounds in funding from the UK Department for International Development since 2009. British taxpayers have sent almost £10million in aid to a paradise in just four years, equivalent to £69,230 for each of the island’s inhabitants, descendants of sailors who took part in the famous MUTINY ON THE BOUNTY. The money pays for almost all public services on the island, because the local pay no tax. Meanwhile, back home in good Ol’ Blighty, we’re suffering CUTS left, right and centre. The axe has fallen on the police, border forces, social services and councils. Christ, street lights are often turned off at night! 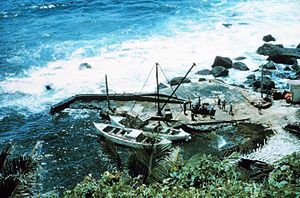 Never mind PITCAIRN being a British Overseas Territory, and thus home to British citizens, the inhabitants financial support is no more than GUILT money. If the British government cut the islanders off, no doubt they would sue us Brits for Captain BLIGH’S harsh treatment of his sailors before the 1789 mutiny, and kidnapping! Second-in-command, Fletcher Christian became a fugitive from British justice and settled on Pitcairn Island, along with other Bounty crew members and some Polynesian girls they had kidnapped on Tahiti. Their descendants still live on the island.